If you’re confused about the proper and improper way to use smoke detectors, you’re not alone. 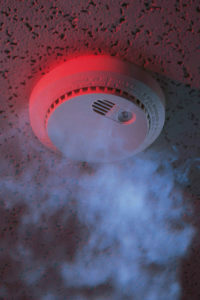 Most people know the value of smoke detectors in their homes. They provide early detection and warning of a fire so that you have a chance to respond and evacuate. Even the best fire detector can’t work if you don’t know how to use it properly, however. If you’re sitting there confused that there’s a proper and an improper way to use smoke detectors, you’re not alone. Read on for Smoke Detector 101. As with most things, the location of your smoke detectors matters for maximum coverage in your home. The National Fire Protection Association has developed a list of the best places in your home to install smoke detectors. While there should be a smoke detector installed in or near the kitchen, it should be at least 10 feet away from the stove or other cook surfaces or appliances, so that you don’t have repeated false alarms. In your sleep areas, you should have at least one smoke detector per bedroom and one additional one. The smoke detectors should be installed in each bedroom so that someone who is sleeping has a better chance of waking up to the alarm. The additional detector should be in the hallway outside of the bedrooms. Finally, you should also have one smoke detector on each floor of your house in addition to the ones already mentioned. This includes the basement, even if it is not finished – place the smoke detector near the stairs that lead up to the main level so you’re more likely to hear it. If you can get an interconnected fire alarm system, that is even better, but you should have at least these smoke alarms in your home. When you’re installing the smoke detectors, make sure that you install them up high within 12” of the ceiling and away from doors and windows. There are two major types of smoke alarms: ionization and photoelectric. Ionization smoke detectors respond more quickly to flames, while photoelectric better detect smoldering fires. Ideally you should have both types in your home for maximum protection. The smoke detector is a valuable tool, but you have to maintain it. You should be checking the detectors every month to make sure they are functional. If your model allows for battery replacement (many newer ones do not), change the batteries once a year so that you know they always have a working battery. When you’re checking the units take time to clean them also. Dust and debris can build up quickly, especially up by the ceiling, so vacuum them at least once a year. Finally, after a decade, most smoke detectors lose effectiveness and you should replace them. This entry was posted on Monday, March 18th, 2019 at 11:16 am. Both comments and pings are currently closed.